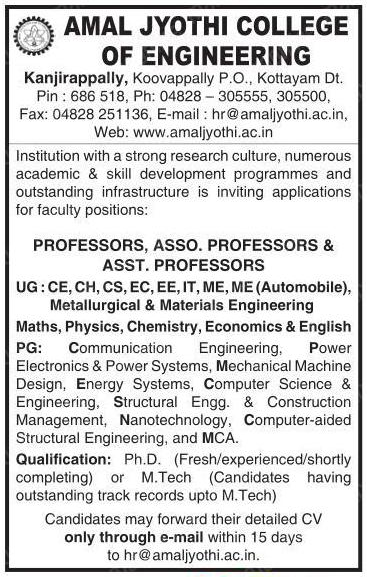 Amal Jyothi College of Engineering, Kottayam has advertised in Malayala Manorama newspaper for the recruitment of Professor/Associate Professor/Assistant Professor jobs vacancies. Interested and eligible job aspirants are requested to apply with in 15 days. Check out further more details below. About College: Amal Jyothi College of Engineering, Kanjirapally, is the first new generation engineering college in Kerala to secure the prestigious NBA accreditation for prime departments. The main features of the college comprise world-class infrastructure, top-flight faculty, high pass percentage, excellent placement record and unique student projects. Amal Jyothi is a mega complex of nearly 13.5 lakh sq.ft. built-up area overlooking the busy Kanjirapally-Erumeli stretch of the Kottayam-Sabarimala state highway. The two campus hostels, taken care of by dedicated Catholic priests and nuns, have a capacity of 2200 inmates.